Been remiss, but for once this means I’ve been doing some work. Huzzah. Project Zero: Finally heard back from Adam C. who is doing the layout. Unfortunately we’re not at the place I had hoped we’d be by the point (i.e. DONE). Instead, I’ve worked with Adam to find a pair of experienced volunteers to take some of the load off his shoulders. Do I have a new estimate for when the Masks Companion will be done. Sadly not yet. Hopefully the extra layout gang will have some happy progress news for me soon… I’ll post more when I have it. Project 1: The Tractor station… I’ve been thinking a great deal about this but that’s about all the actual progress I can report. I usually have a long period of contemplation followed by a nice sustained burst of work when I get to this point in a project- let us hope that is the case again. Sorry Dustin. Project 2: Nothing to report as I’m not putting much effort into this until publisher who shall remain nameless makes progress on other fronts. Project 3: Done some helpful research on all topics and have a general outline of both the pieces I’m working on for the Unspeakable Oath. I only have until the 18th to get these done so I’ll be plugging away until then. I’m happy with what I have so far and am hopeful they will be well received. “Project 4”: (Do not laugh). Yeah, I take on too much as once, but I like to work when inspiration strikes. I had an idea for a piece involving New England cemeteries for one of the CoC licensees. I’ve done some preliminary research, including mucking about a few old burying yards (one of the perks of living in New England). Not a priority right now but I think there is enough there to keep this one on the steady burner for a while. Other stuff: Amusingly enough I finally got in touch with a couple other Cthulhu authors in my neck of the woods only to discover one of them is my neighbor. Literally. To celebrate, we’ll be playtesting Dan Harm’s Fury of Yig campaign. I’ll post oblique updates (since I don’t want to spoil it) as they warrant. Happily a correspondent has provided me some much sought information about the book in question for Project 3. Progress! 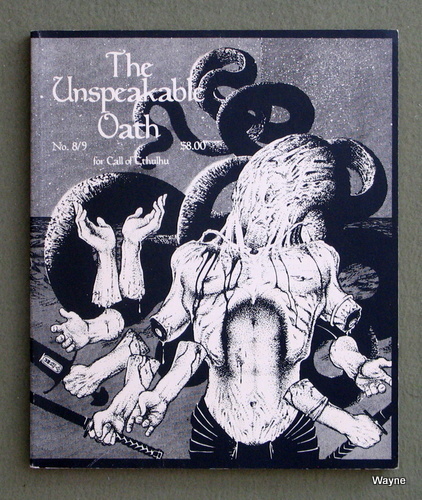 So, back from the dead (or at least dead-ish) comes the Unspeakable Oath, the seminal Call of Cthulhu magazine of the 90s. There have been rumblings of its return for some time now, especially in the wake of the shuttering of Worlds of Cthulhu. I’m glad to see it return as there is a definite void (assuming The Black Seal continues to “nap”). More info on the revivified Oath can be found here. Since I am a glutton for punishment, I’ve decided to try my hand at crafting a submission (or two) for the Oath. I dub these writings “Project 3”, though they will be far shorter than either Project 1 or Project 2 (and I think there are phone books shorter than Project 0) so they shouldn’t detract from my work on either of these pieces; I just couldn’t let a chance to get something in UO pass me by. My thought it to do (yet again) another tome write-up (a la my piece on the Turner Codex), this time a certain tome from the library of Joseph Curwen… as the theme for the issue is “resurrection”. 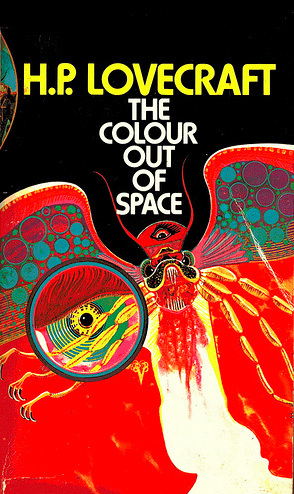 I’ve done a survey of the game literature (nearly nothing) and the fiction (barely a bit more) and am now pondering (which is to say waiting for inspiration to strike) awaiting the arrival of a little more info from a helpful source. Fun story- when I lived in Iowa I attempted to order issue 16/17 at my local hobby shop. After waiting a few months and seeing that it had been released, I asked the clerk if it had arrived. He apologized and said they’d not been able to get a copy… due in no small part to the fact they misunderstood the name of the magazine to be the Unspeakable Oaf. Sigh. Also, you can listen to the Atlanta Radio Theater Company’s adaptation of the same story HERE. Groovy, eh? While in Clinton (which is oddly enough a town on the edge of the Wachusett Reservoir (yeah, I’ll get to “The Colour Out of Space” soon)), I recommend Lou’s Diner which has truly excellent french fries.